Janet from the blog Words That Can Be Your Own recently organised a Thrifty Christmas Gift swap. 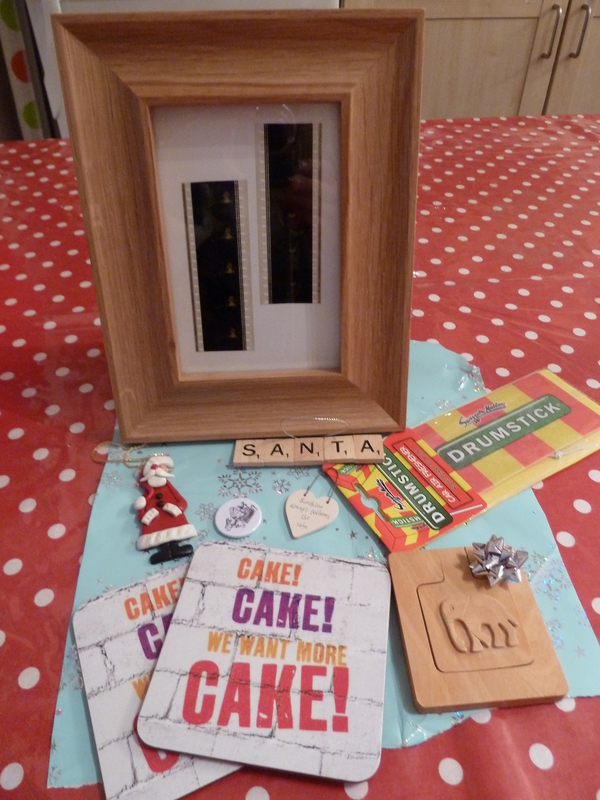 I really enjoyed participating and the parcel I received from Leanne was just gorgeous. I managed to save it to open on Christmas day….with some reluctance I must say. Leanne must have done her homework as the prezzies she sent were all very me. There were a couple of lovely decorations for my tree which are now adorning said tree of course. A pretty wooden heart with the words Sunshine Always Follows the Rain inscribed on it. A retro Drumstick lolly scented car air freshener which actually does smell like a real drumstick lolly. A couple of cute coasters which say Cake Cake We Want More Cake on them. Yes my weakness is certainly cake! Leanne also sent me a very cute handmade card which I love. Previous Post2013 In Pics. :)Next PostWinter walk round Brockholes Nature Reserve.